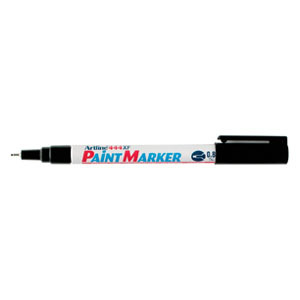 The Artline 444 Paint Marker is able to be used indoors and outdoors and will not compromise the permanency of the ink. The Artline 444 Paint Marker dries quickly, and once dry, the ink is highly water and fade resistant. The Artline 444 Paint Marker is completely opaque, even when applied to dark or transparent surfaces. The colour will remain vivid over a long period of time. 0.8mm nib.